The Kenmore Elite line of clothes washers features high-efficiency technology that is designed to keep your clothes clean while increasing the amount of laundry you can do in one load and decreasing the amount of water you use each time you turn the device on. The operating instructions for the Kenmore elite are fairly basic. Open the lid of the Kenmore Elite HE washer and put in a load of laundry. The load should be sorted by color to avoid bleeding colors. Distribute the load evenly in the container to prevent the washer from becoming unbalanced and do not overfill the washer with clothes. 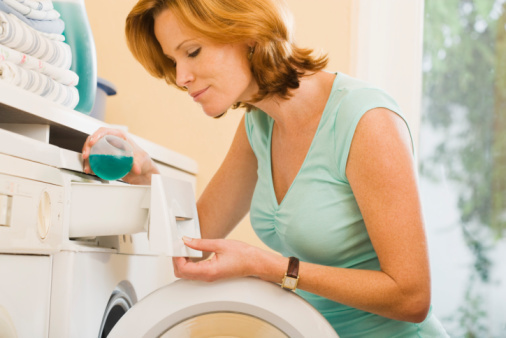 Put a measured amount of laundry detergent into the dispenser on top of the clothes container. Do not pour the detergent into the container or onto the clothes inside. You can put either liquid or powdered detergent into the dispenser. Put bleach into the bleach container if you are washing whites. Pour liquid bleach directly into the dispenser, not into the washer or on the clothes inside. The bleach will be dispersed at the appropriate time during the wash cycle. Put fabric softener into the fabric softener dispenser if needed using the same method. Close the washer lid, making sure that no clothes are sticking out or preventing the lid from closing fully. Press the "Power" button on the control panel of the Kenmore Elite HE washer to turn on the display and begin programming. Turn the cycle dial to the appropriate wash setting. These settings are listed by the type of load you are doing, for example whites or dark colors. Press the modifier buttons such as "Soil Level" and "Water Level" to change the settings. The settings of each modifier are highlighted with a green light by the selected option. Press the "Start" button to begin the wash immediately or "Delay Start" if you want to start later. If you press "Start," the display will show how much time is left in the cycle. If you press "Delay Start," the display will show how long until the washer starts. Each time you press "Delay Start" will add an hour to the time, up to nine hours.